This oceanfront hotel offers world-class amenities, comfort, and unsurpassed luxury. Spacious 1,800-3,100 square foot residences have fine linens and signature bath amenities, with contemporary tropical-eastern decor throughout. Situated just steps to a pristine beachfront, enjoy the lush tropical gardens, waterfalls and world-class golf, tennis, shopping & dining nearby. Nestled above the golden sands and pristine blue waters of Wailea Beach in the heart of the Wailea Resort community, Wailea Beach Villas will feature spectacular views of the West Maui mountains and the islands of Lanai, Kahoolawe and Molokini Crater. 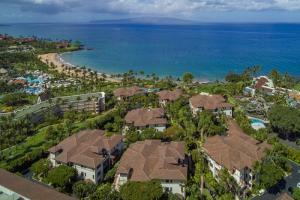 The Wailea Beach Villas residences are located adjacent to The Shops at Wailea, a myriad of eateries and neighbor to an array of world-class, full-service luxury hotels and destination spas.